Sivard is an authentic primitive, full of talent and stuffed with humor.This exhibit proves it. He forgets his official mission as an American diplomat when seated before his easel; his laundries, bars, pedicurists and other curiousities of our capital are astonishingly successful pictures. But the real masterpiece is ‘La Place de la Concorde’ viewded from above, a synthesis done in silver gray, brown and black which makes one think of the architect’s plan of centuries ago. Let’s applaud him! Bakers, watchmakers, snail sellers- these are among the people, stiff and a little ridiculous, that Sivard places in front of the decor of his little shops covered with inscriptions. The Parisian street, as seen by this American humorist, is both terrifying and full of wisdom. Details of a meticulous precision in a style reminiscent of Image D’Epinal. Robert Sivard, an American endowed with plenty of humor and poetry, had studied painting in the US. Then he worked in comercial art. Now, at age 40, he has a diplomatic job: chief of visual information for the Economic Cooperation Administration of the United States Embassy. This dignified position doesn’t prevent him from observing the old streets and small shops of Paris with an amused and attentive eye. Sivard places himself among the ‘naive’ painters, but it’s a sophisticated naivete, rendered perfectly. The works are well-defined caricatures; the colors are clear and gentle. The neighborhood butcher, or animal hospital... Sivard loves the old-fashioned shops, the narrow streets and their nostalgic inhabitants. He renders the surfaces of the old stone walls perfectly. Endowed with an excellent visual memory, he loves the details, leaving little to the imagination. 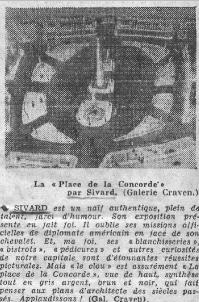 Sivard, from modern America, is an artist who finds pleasure in the anachronism and tranquility of a world indifferent to progress. (Craven Gallery).